There’s been a lot of talk about the newest restaurant in town, Gowdy’s Seafood. It’s located in the Kroger shopping center on Murfreesboro Road, so easy access, good parking. My husband and I decided to give it a try last week and we were willing to spend some money to try a few different items. Our total bill was over $40 but that included a tip. Also you got a free piece of cheesecake if you spent $25. First a heads up… everything there – all main entrees – are fried. No broiled or baked. Fried. Also, everything comes with french fries. And there are no substitutions (though you can separately order sides). Gowdy’s menu on the wall. I have always been a huge fan of tilapia which is one of their menu items. Unfortunately I’ve had to stop eating it because of the whole “let’s grow this weird fish in China and feed them chicken poop” thing. No more tilapia for me unless someone can prove that this is an urban legend. Please prove it to me… I beg of you. So I ordered the three pieces of whiting, my husband ordered the six-pieces of chicken wings with hot sauce, and together we ordered the jumbo shrimp. Again all fried. With three servings of french fries. And three slices of wheat bread. There was one order in front of us that someone had called in, so we waited only about 10-minutes for our to-go order. All orders are to-go because there is no restaurant seating – which is great with me because I always prefer to take food home and eat it (it allows me to lick my fingers or wipe my drool or burp or whatever out of public view) (also I’m kidding about all that… I’m just good with eating at home). So the food. The whiting was just okay. 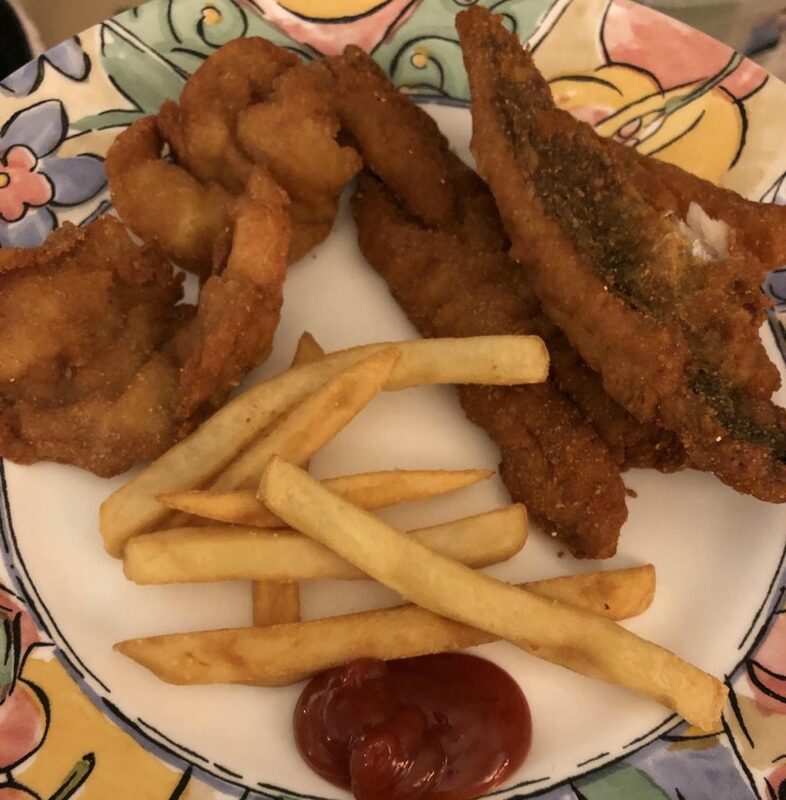 My husband thoroughly enjoyed it, but for me it still had the skin on it (the dark part of the fish in the photo below) and I wasn’t a fan of peeling it off. I thoroughly enjoyed the shrimp, but my husband thought the shrimp had too much breading. I don’t eat spicy anything so didn’t sample the hotted-up chicken. My husband was impressed that the six pieces were actually 12 because they didn’t break apart the original wings. But I doubt he’d order the chicken again because it wasn’t heat-hot. Yes it was cooked thoroughly, but perhaps pre-cooked and not just warmed up enough? We had way more food than this, but that’s the amount of what I eat! We both would like to go back and sample the whiting nuggets and I’d definitely get the shrimp again. I also want to try the fried mushrooms and the gizzards. In the end, I would recommend that Gowdy’s let customers choose what sides to go with their entrees because those of us without gall bladders can’t always deal with only “fried” choices. I would also like to see a broiled fish with a lemon seasoning added to the menu – and maybe some scallops. I will go back to Gowdy’s Seafood as they are still finding their sea-legs still (haha seafood, sea-legs). I sincerely hope they find success here in LaVergne, but they may need to make some tweaks to truly flourish. Thanks for the review! We have been waiting until they are open and settled in before we go. But I love catfish, so I can’t wait! I wish them well and hope La Vergne supports them. I won’t be eating there, though. I’m just not a fan of fried seafood. Having lived on the coast for many years, I got spoiled by all the fresh seafood. I haven’t tried any of the seafood entrees yet, but their fried gizzards are some of the best I’ve had in years. 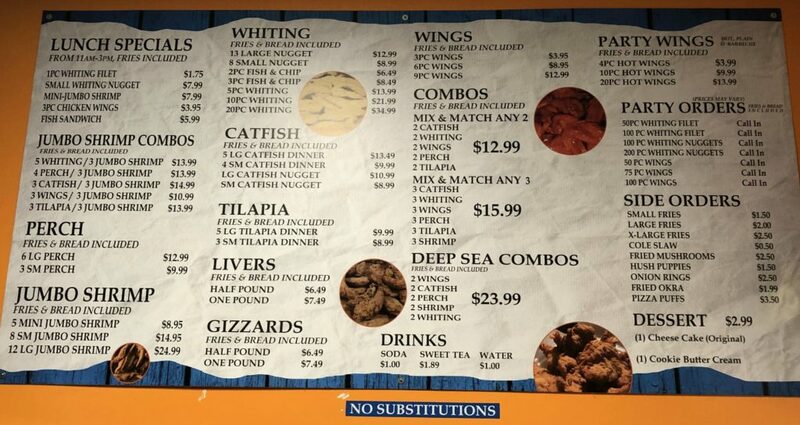 We got shrimp,catfish, whiting and wings. Shrimp,catfish and wings were great. Whiting was a little fishy tasting .for our taste. Fries a little soggy but we still enjoyed it. Will try the perch next time. My husband & I were Super Excited when we found out we were going to get a new seafood place here in toy! So looked at menu-Yum. We got a large order of whiting, large order of livers and fried okra. We were So Disappointed. The whiting was salty and I couldn’t even eat it, livers way overdone & didn’t look like the promised pound on said menu. French Fried and okra were all I could manage to eat. My son and husband picked at the Rest and threw most of it away including the BREAD. I Really Wanted It to be Good, but Sorry to say-It Just Was Not or not what I expected. Won’t waste my Money there again. Not much food for the price either. Could’ve gotten More food and Better from Captain D’s. Sorry Guys-Just my honest opinion. My husband & I were Super Excited about the new seafood place-Gowdy’s. Ordered the whiting, large order of Livers and okra. We were expecting something Tasty, but we got Wimpy salty whiting, over cooked Livers and Sure didn’t look like a pound to me. I only ate a few fries and the okra which probably came from a bag of frozen. My husband and son ate some of the fish and Livers, but the Rest went in the trash along with the BREAD! I Really wanted to LOVE this place, but for the quality, quantity and prices…We unfortunately won’t be back. Not what we expected…I Really wanted to Love this place, but the whiting was Very Salty, Livers Over Cooked and the Bread went into the garbage. Fries and okra were good. We may try again once they’ve been open longer, but Sorry unfortunately We were not impressed. Good Luck Hope You Guys make it!